Rarely does a home in the exclusive area of Reef Club Drive appear on the market. Intracoastal waterway view all the way to Harbourtown. 4 bedroom, 4 full bath 2 1/2 baths. Access to mother in law suite from outside. Wrought iron tile decks on two levels. Small beach behind home at low tide. Great place to kayak. Home was renovated in top quality materials. Elevator 3 floors. Two laundry areas. Sunsets are magnificent overlooking water. New sliding glass doors installed. Great garage space. We are thrilled to introduce this rare offering directly on the harbor. Meticulously constructed with high quality standards and beautifully appointed throughout. At almost 5,000 SF, this is a true statement of grandeur and luxury, complete with a private 70' boat dock directly out back. 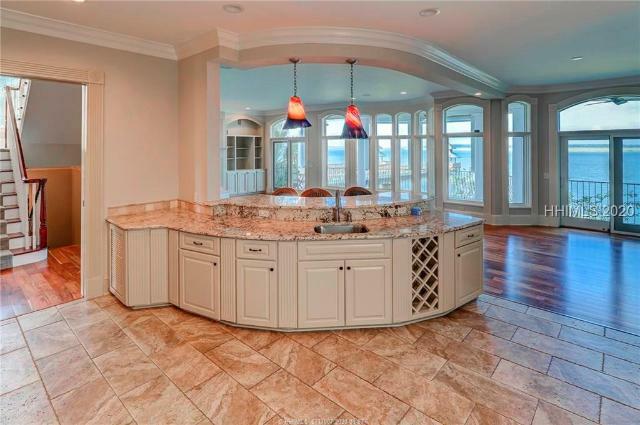 The masterfully designed Chef's Kitchen, spectacular millwork and fine detail commands admiration. Every inch was thoughtfully planned and perfected. Step out back and enjoy the heated spa overlooking the Harbor... ideal for relaxing & recharging or enjoying cocktails & sunsets. Plus the triple-car garage is suitable for many of today's larger SUVs. Want to live on the water with the best views for the best price? Windmill Harbour has the best views anywhere on the Island for the money. 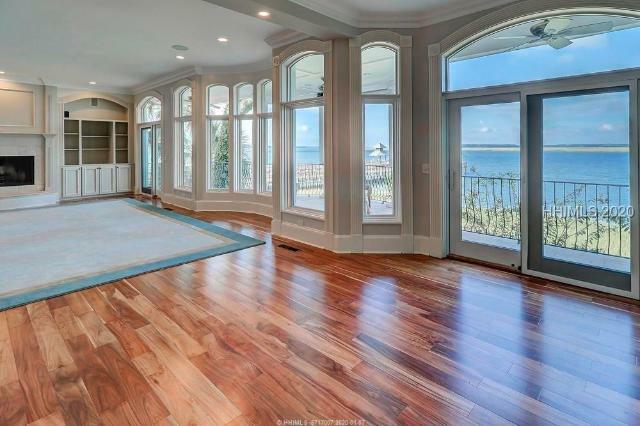 Spectacular luxury updated home with views to Harbourtown. Eternal sunsets from the veranda to enjoy every day. Perfect location where you can walk to your yacht parked in the harbor across the street. 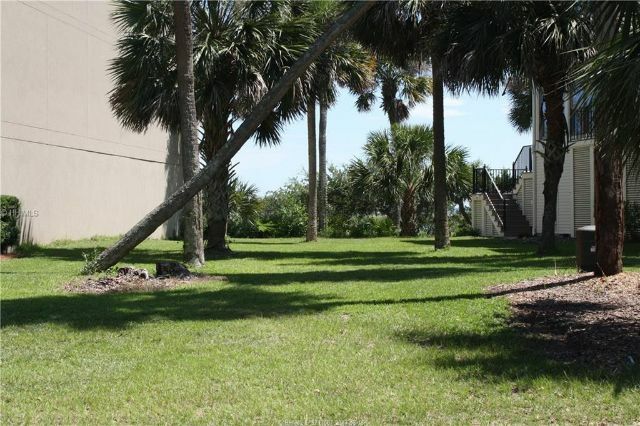 Enjoy a private gated community with the SC Yacht Club at your back door. Luxury home has all the upgrades you would desire, hardwood floors, granite counters, high end appliances, elevator to the top and gorgeous master suite with a beautiful en suite bath. Plenty of guest rooms for everyone. Must see. Exceptional quality of craftsmanship is found throughout this 4 Bedroom 4 Bath home which was meticulously remodeled in 2009 with new electrical, plumbing, hurricane windows and more. Over $700,000 spent on remodel. Elevator access to all floors. This home boasts 2 Master Suites, Great Room with coffered ceiling and open kitchen with stainless steel appliances and gas cooktop. Enjoy serene views of Jarvis Creek and the surrounding marsh from the screened-in porch. Deeded open space on the right side affords extra windows, light and privacy. 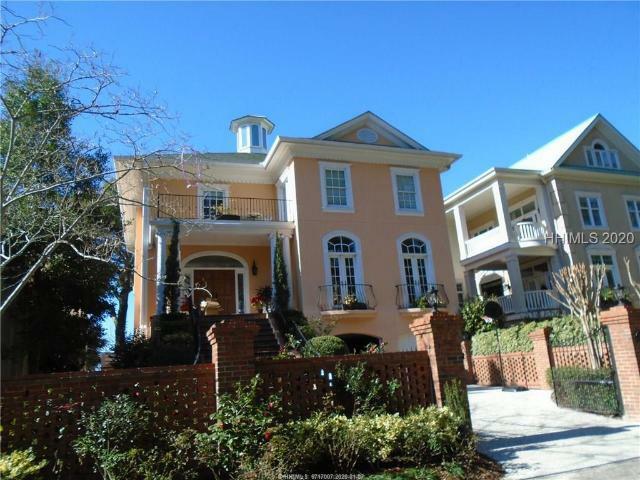 Spacious 4 BR home on the beautiful marshes of Hilton Head Island. Master is on the main level and you have 3 bedrooms plus a huge loft on the second floor. This home has a great feel to it- heart pine floors, voluminous ceilings, tin tiled ceiling in powder room with antique vanity, 2 laundry rooms, awesome dining room and so much more. Enjoy the gorgeous sunsets while relaxing on your wrap around back deck. Own your own piece of paradise while you still can. Why buy a home that you will spend years remodeling , when you can build the home that fits your lifestyle? 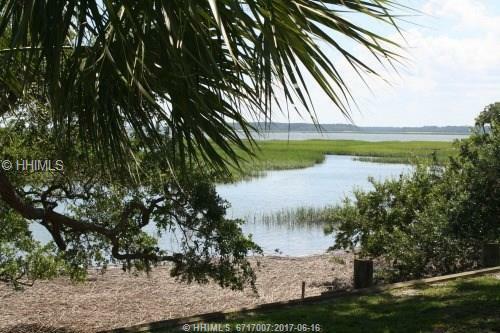 Town house lot has breathtaking views down the ICW. End unit will allow for windows & abundance of light down one side. You have double views - marina out front- marsh out back. Windmill Harbour is a special place on the Island- quaint and colorful- with the charm of Charleston. Enjoy dining and social events at the South Carolina Yacht Club, cruising to Savannah or Charleston with the cruise fleet, or taking in a tennis match at the Sports Center. Have you been dreaming of docking your boat in your backward? With a 70 foot slip and over a quarter acre of land, you can turn your dream into reality. We've consulted with a local notable architects and builder to conceptualize a beautiful home for you. Cruise in and out of the Windmill Harbour Marina and enjoy the astonishing views of the lowcountry from the Intercoastal waterway. Hilton Head island, SC is a boaters paradise. The home build is not included in the list price and is OPTIONAL. Call to see proposal. Final plans are subject to approval. Cost of build is subject to change. This is fantastic waterfront villa, with the best of outside living in the Windmill Harbour community. A glass/screened porch overlooking the Windmill Harbour Marina and a courtyard patio in the front of villa. The townhouse has an airy living/dining rm w/. Two bedrooms/baths on the 2nd fl.The master bedroom has sliding glass doors which open onto balconies overlooking the front garden below. The second BR views the marina. Walk to the South Carolina Yacht Club, enjoy an active boating community, with bike and walking paths, and is very pet friendly. 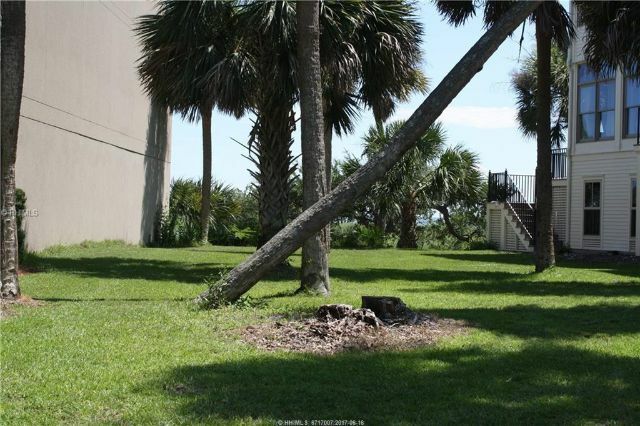 The marina has a locked water level system with direct access to the intracoastal waterway. Very rare 3 BR, 3.5 BT end unit villa with a screened porch! This villa lives like a home but w/o the outside maintenance. Some outstanding features are the front trellised brick courtyard leading into the first floor bedroom (or den), custom KT w/subzero fridge, bosch range, raised bar & great breakfast area w/ bay window. The GR has a 2 story ceiling w/ unique round windows, fireplace & built-in bookcases. Spend the afternoon w/ friends watching a game in your huge, tiled screened porch overlooking wooded common area- plenty of privacy. Upstairs are 2 BR each w/ private baths that have been updated, plenty of storage and lots of light. Only steps to the SCYC for dining and social activities. This is a must see! Close to the Harbour. Much nicer and newer than other units. Shows beautifully. Many upgrades including expanding the porch to a Carolina Room. Actual sq.ft. now 1572. Updated kitchen, new carpet, new paint, granite counter tops, stainless steel appliances. Also, smooth painted ceilings, new HVAC, new master bath, shower, double vanity, hardwood floors. Back porch has brick pavers. Must be seen to be appreciated. Priced to sell.